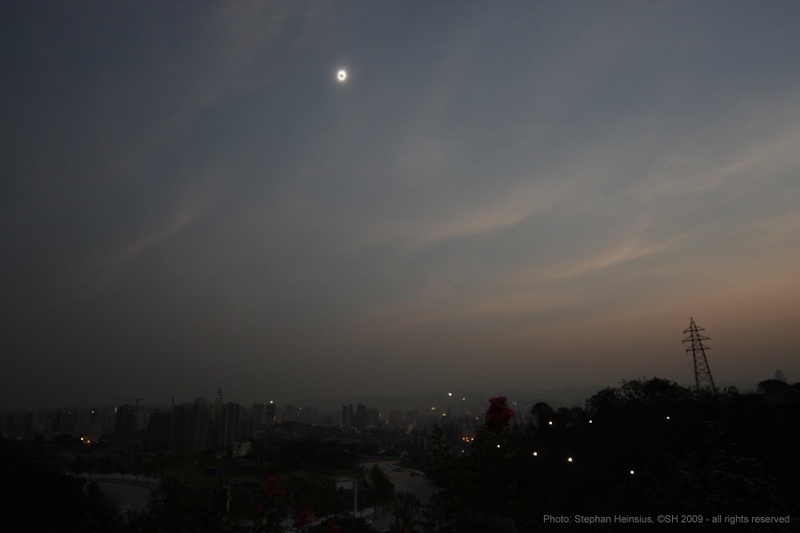 Explanation: The daytime sky grew dark, the temperature dropped, and lights came on as Chongqing, China, was plunged into the Moon's shadow during the July 22nd total solar eclipse. This serene, wide-angle view of the event looks to the east over the large, populous city from a newly constructed park. Despite thin clouds, it captures the shimmering solar corona just before the end of the eclipse total phase. This total solar eclipse occurred near Aphelion, the point in Earth's elliptical orbit farthest from the Sun, and so the Sun was near its smallest apparent size. It also occurred when the New Moon was near Perigee, the closest point to Earth in the Moon's elliptical orbit, making the Moon near its largest apparent size. The small Sun and large Moon made this the longest solar eclipse of this century.